This condominium resort is nestled oceanfront above Honokeana Bay north of Ka`anapali, and is just a short drive from Ka`anapali's shops and amenities. All one- and two-bedroom condominiums are either ocean view or oceanfront. Amenities include cable TV, high-speed Internet access, pool, full kitchen, washer/dryer and free parking. 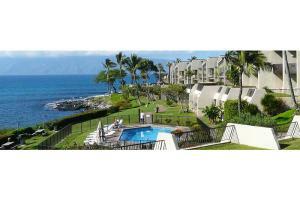 23 miles from Kahului Airport.